Context: Pressure ulcers are among the main postoperative complications which isassociated with an increased length of hospitalization. Determining risk factors of postsurgical pressureulcers is crucial for developing prevention and treatment strategies. Aims: This study aimed to investigate the incidence rate of pressure ulcer and related risk factors after general surgery. Settings and Design: This descriptive cross-sectional study was carried out in three hospitals in Mazandaran province in 2016. Materials and Methods: The sample size was 191 surgical patients undergoing general surgery by using census method. Data were collected in pre-, intra-, and post-operative period using demographic and clinical questionnaires and also, through the Braden Scale for Predicting Pressure Ulcer Risk. Statistical Analysis Used: Descriptive statistics, t-test, Chi-square, and univariateand multivariate logistic regression were used to analyze the data. Results: The incidence rate of postoperative pressure ulcers in patients was 17.8% (34 out of 191 patients). Based on the multivariate logistic regression model, significant correlations existed between the incidence of pressure ulcers and the following variables: age over 70 years old (P = 0.003), history of hypertension (P = 0.035), history of heart diseases (P = 0.029), Braden score <15 (P = 0.017), type of surgery (P = 0.003), and type of anesthesia (P = 0.015). Conclusions: Since it is critical to consider the incidence of postoperative pressure ulcers among patients, further measurements are required to identify high-risk people and use preventive protocols by nurses at pre-, intra-, and post-operative levels. Moreover, it requires extra attention in patients over 70 years, those with a history of hypertension and heart diseases, and those undergoing emergency surgery and spinal anesthesia. Pressure ulcer is one of the main postoperative complications. National programs have been initiated to manage this problem and to stimulate preventive actions. The National Pressure Ulcer Advisory Panel has defined this wound as a skin integrity disruption since an outer surface emerges due to the tightness of soft tissues among bony frills. This ulcer is generated as a result of impaired tissue perfusion and the loss of part of the body's cells that progressively ruins its lower layers. In Iran, there is limited information regarding the incidence and the associated factors of postoperative pressure ulcers in patients undergoing general surgery. Therefore, this study aimed to investigate the incidence rate and also the risk factors of pressure ulcers development among patients undergoing general surgery in Mazandaran in 2016. This descriptive cross-sectional study was conducted on patients undergoing general surgery at three teaching hospitals In cities of Babol and Sari, Mazandaran province from April 2016 to July 2016 by using census method (n = 191). This study was approved by Ethics Committee of Mazandaran University of Medical Sciences (code = IR.MAZUMS.REC.94.1777), and the written informed consents were obtained from the participants. Patients who met the inclusion criteria were selected. Inclusion criteria were patients undergoing general surgery, age above 18 years old, postoperative hospitalization more than 48 h, and the surgical length more than 2 h (even emergency patients). Exclusion criteria were the presence of pressure ulcers before entering the operating room and patients' death in the first 24 h after surgery. The incidence of pressure ulcers in these patients was evaluated every 24 h in postoperative period, up to 72 h after surgery. Data were collected using demographic and clinical questionnaires before, during, and after surgical operation. The preoperative demographic and clinical questionnaires consisted of questions about gender, age, education, place of living, height, weight, and body mass index (BMI) and history of predisposing diseases. The intraoperative questionnaire included a question on the type of anesthesia, elective or emergency state of the surgery, the duration of the surgery, diastolic blood pressure <60 during surgery and the use of inotropes. The postoperative questionnaire contained the presence of postoperative pressure ulcer. These questionnaires were completed by referring to the patient's medical history and based on the researcher's observation. In this study, all the patients benefited from the wavy mattresses; therefore, this variable was not examined since it was the same among all the patients. In addition, two other forms, i.e., Braden Pressure Ulcer Risk Assessment Scale and Skin Evaluation Form were used to evaluate the status of pressure ulcers. Braden form was completed for patients before surgery. This scale included six indicators, such as sensory perception, moisture, activity, mobility, nutrition, and friction or shear. The minimum and maximum scores of this scale are 6 and 23, respectively. Patients with Braden scale scores 15–18, 13–14, 10–12, and ≤9 were considered to be at low, moderate, high and extremely high risk of developing pressure ulcers, respectively. It has been previously showed that Braden scale had a sensitivity of 92% and a specificity of 74%. However, the reliability of this scale in our study was done in a pilot study on 15 patients, and the Cronbach's alpha coefficient was 0.89. The skin evaluation form includes the classification of pressure ulcers by the International Association of Pressure Ulcers that to a greater extent deals with the clinical features of pressure ulcers. That is Stage 1: An erythema is formed on the body under pressure that does not turn white by finger pressure, which represents the formation of pressure ulcers In future. Warmth and stiffness bruising symptoms may appear in the pressure place. Stage 2: Due to loss of the epidermis, dermis, or both, thickness of the skin are considerably reduced. The wounds are superficial, and they are clinically determined in the form of abrasion, a blister or a shallow dimple and the pressure ulcers are usually painful. Stage 3: This stage encompasses the skin thickness that spreads downwards to the fascia. At this stage, the ulcer is completely removed the damage and subcutaneous necrosis arising at this stage appear in the form of a deep dimple, which sometimes spreads to the surrounding tissues. Wound recovery lasts for months. Stage 4: The skin thickness completely disappears which is associated with tissue necrosis, as well as damage to muscles, bones and related structures, tendons, and joint capsule. Recovery takes months and sometimes years. Validity and reliability of skin evaluation form have been approved by many researchers.,, In a study, the reliability of the Cronbach's alpha (0.95) was determined. In another study, the sensitivity of this scale was as high as 83%–100% and its specificity was 64%–77%. After completion of the questionnaires, the data were analyzed using SPSS 16 (version 16-SPSS 16.0 Student Version for Windows Inc. SPSS©2009) and descriptive (average–median–standard deviation) and inferential statistics (t- test, Chi-square, and Fisher's exact test for quantitative and qualitative variables, respectively). In addition, univariate and multivariate logistic regression models, odds ratio were used to eliminate the influence of possible confounding. Patients' demographic characteristics have been shown in [Table 1]. The results of the study showed that in patients who developed pressure ulcers, the mean and standard deviation of BMI was 26.01 ± 3.02. 1.98% of all pressure ulcers were at Stage 1 and 5.27% were at Stage 2. We found that 18.2% of nondiabetics versus 16.9% of diabetics developed pressure ulcers. In addition, 31.6% and 16.3% of the patients with and without a history of hyperlipidemia, respectively experienced pressure ulcers. 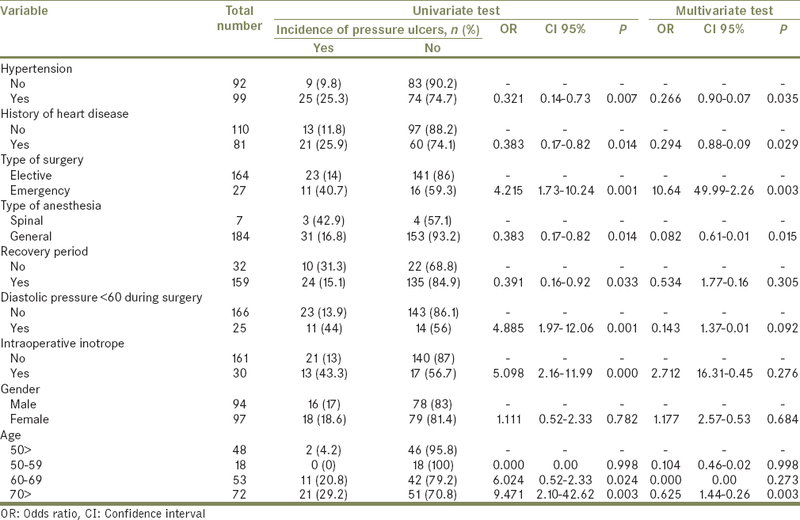 Other clinical factors associated with the incidence of pressure ulcers in general surgery patients are shown in [Table 1]. The results of the multivariate regression analysis showed that age over 70 years, history of hypertension, history of heart disease, type of surgery, and type of anesthesia, statistically had a significant relationship with the incidence of pressure ulcers [Table 2] and [Table 3]. This study has been shown that the incidence rate of pressure ulcers among general surgery patients, 72 h after surgery, was 17.8%. Campbell et al. showed that heel ulcer incidence, during 1 month after discharge, in patients undergoing orthopedic surgery was 17%. However, in another study, reported rate of ulcer was 9.8%. In this study, the incidence of pressure ulcer was evaluated immediately after surgery, but in our study, patients were evaluated 72 h after surgery. This study showed that the incidence rate of pressure ulcers in men and the women was 17% and 18.6%, respectively. In line with the results of our study, it has been shown that the incidence rate of pressure ulcers is higher in women., However, some other studies have reported a higher incidence rate of pressure ulcers in men.,, One possible explanation for the higher incidence rate of pressure ulcer among men can be attributed to the difference in the distribution of adipose tissue in females, which can be a protective factor against pressure ulcer development. Contrary to the results of our study, a study showed a significant association between diabetes and the rate of pressure ulcers. However, another study found insignificant relationship between history of diabetes and the incidence of ulcers, which is consistent with our findings. The possible explanations for insignificant relationship between history of diabetes and developing postoperative pressure ulcer in this study might be explained by the relatively small sample size and other risk factors that were not address in this study, such as degree of diabetes control by the patients and smoking history, which warrant further investigation. We found insignificant relationship between the history of hyperlipidemia and the incidence of pressure ulcers. To the best of our knowledge, no study has been done on the relation between the histories of high cholesterol with the incidence of ulcers. Our data indicate that the history of hypertension could increase the risk of development of pressure ulcers up to 0.266 times which have a significant relationship with the incidence rate of pressure ulcers. This finding is in consistent with other published studies., Hypertension can decrease circulation and therefore increase the likelihood of pressure ulcer development. The presence of heart disease in patients' medical history had an impact on the incidence of pressure ulcers, which is in line with the result of another study. Heart disease is an important factor in the incidence of pressure ulcers because it affects the peripheral blood circulation and tissue perfusion. The intraoperative factors that affect the incidence of pressure ulcers could be the type of the surgery, in terms of being elective or emergency. Findings of this study indicate that emergency surgery increases the risk of pressure ulcers 10.64 more times; and the type of surgical operation has a significant relationship with the incidence of ulcers in the logistic model. To our knowledge, no similar study on the emergency patients has been done. The emergency patients have a higher risk of developing pressure ulcers due to their acute conditions, such as excessive bleeding, hypotension, acidosis, a state of shock, and the like. In the present study, the incidence rates of pressure ulcers in patients with spinal anesthesia were greater than patients with general anesthesia. This finding is in line with the results of studies by Fu Shaw et al., and Scarlatti et al., Using anesthetic drugs for anesthesia reduce, the sensitivity of the patient to pain and pressure; also can lead to some degree of vasodilation and consequently resulting hypotension and reduced tissue perfusion. Intraoperative diastolic pressure of <60 was significant in univariate analysis, but, insignificant in the multivariate analysis. This result is consistent with the results from previous studies. The reason could be attributed to the method of taking blood pressure, periods of blood pressure evaluation, and the duration of low blood pressure which varies in different studies. Another finding of this study is that in multivariate analysis using of intraoperative and postoperative inotropes were not associated with the incidence of pressure ulcers. This finding is with the results from the previous study, indicating that there was no association between using noradrenaline with the incidence of pressure ulcers. In both studies, only using inotropes were and the dose and duration of inotrope use were not checked, which could influence the results. The other finding of this study is the effect of postoperative recovery period on the incidence of postoperative pressure ulcer. Patients who did not experience of the recovery period after surgery and transferred directly to the intensive care unit had greater chance of developing pressure ulcers compared with patients who had recovery period. Indeed, the recovery period had significant relationship with the incidence of pressure ulcers. To our knowledge, no studies on the recovery period has been done yet. This study has some limitations which have to be addressed. The present study was conducted only on general surgery patients; therefore, the results cannot be generalized to all patients undergoing other surgeries. In addition, the more accurate evaluation of duration of postoperative inotrope use and investigation of other possible confounding variables and comparison of such variables and factors between the two groups can provide more accurate information in this regard. The incidence rate of pressure ulcers was higher in women and patients above 60 years old. History of hypertension and heart disease were the preoperative risk factors for the development of pressure ulcers. The emergency surgery and spinal anesthesia were the intraoperative risk factors and absence of postoperative recovery, and postoperative use of inotrope were the risk factors for developing pressure ulcers. The results of this study can help the health-care providers to identify the patients at higher risk for pressure ulcer development after surgery to perform an appropriate prophylactic intervention for its prevention. This study was supported by the Mazandaran university of Medical science. The authors appreciate all those who participated in this study. Primiano M, Friend M, McClure C, Nardi S, Fix L, Schafer M, et al. Pressure ulcer prevalence and risk factors during prolonged surgical procedures. AORN J 2011;94:555-66. Black J, Girolami S, Woodbury G, Hill M, Contreras-Ruiz J, Whitney JD, et al. Understanding pressure ulcer research and education needs: A comparison of the association for the advancement of wound care pressure ulcer guideline evidence levels and content validity scores. Ostomy Wound Manage 2011;57:22-35. Girouard K, Harrison MB, VanDenKerkof E. The symptom of pain with pressure ulcers: A review of the literature. Ostomy Wound Manage 2008;54:30-40, 42. Sevdalis N, Hull L, Birnbach DJ. Improving patient safety in the operating theatre and perioperative care: Obstacles, interventions, and priorities for accelerating progress. Br J Anaesth 2012;109 Suppl 1:i3-16. Palfreyman SJ, Stone PW. A systematic review of economic evaluations assessing interventions aimed at preventing or treating pressure ulcers. Int J Nurs Stud 2015;52:769-88. Nixon J, Cranny G, Bond S. Skin alterations of intact skin and risk factors associated with pressure ulcer development in surgical patients: A cohort study. Int J Nurs Stud 2007;44:655-63. Hoshowsky VM. Surgical positioning. Orthop Nurs 1998;17:55-65. Karadag M, Gümüskaya N. The incidence of pressure ulcers in surgical patients: A sample hospital in Turkey. J Clin Nurs 2006;15:413-21. O'Brien DD, Shanks AM, Talsma A, Brenner PS, Ramachandran SK. Intraoperative risk factors associated with postoperative pressure ulcers in critically ill patients: A retrospective observational study. Crit Care Med 2014;42:40-7. Price MC, Whitney JD, King CA, Doughty D. Development of a risk assessment tool for intraoperative pressure ulcers. J Wound Ostomy Continence Nurs 2005;32:19-30. Borghardt AT, Prado TN, Bicudo SD, Castro DS, Bringuente ME. Pressure ulcers in critically ill patients: Incidence and associated factors. Rev Bras Enferm 2016;69:460-7. Bhattacharya S, Mishra RK. Pressure ulcers: Current understanding and newer modalities of treatment. Indian J Plast Surg 2015;48:4-16. Wilchesky M, Lungu O. Predictive and concurrent validity of the Braden scale in long-term care: A meta-analysis. Wound Repair Regen 2015;23:44-56. Gadd MM, Morris SM. Use of the Braden scale for pressure ulcer risk assessment in a community hospital setting: The role of total score and individual subscale scores in triggering preventive interventions. J Wound Ostomy Continence Nurs 2014;41:535-8. Ghavidel AA, Bashavard S, Abkenar HB, Payghambari MM. Incidence rate of pressure sores after cardiac surgery during hospitalization and its relevant factors. Razi J Med Sci 2012;19:18-29. Benbow M. Guidelines for the prevention and treatment of pressure ulcers. Nurs Stand 2006;20:42-4. Mehrabani MH, Nouroozi K. Comparison of honey dressing with hydrocolloid dressing effects on pressure ulcer healing of ICU hospitalized patients. J Health Promot Manag 2012;1:37-45. Bolourchifard P, Rahim DA. The incidence of pressure ulcer risk factors in hospitalized patients in the orthopedic ward. J Fac Nurs 2009;9:1-5. Soozani A, Khosravi A, Pourheydari M, Montazeri A. Using Braden and waterlow scales to predict pressure ulcer. Knowledge and Health 2011;5:43-8. Campbell KE, Woodbury G, Labate T, LeMesurier A, Houghton PE. Heel ulcer incidence following orthopedic surgery: A prospective, observational study. Ostomy Wound Manage 2010;56:32-9. Fu Shaw L, Chang PC, Lee JF, Kung HY, Tung TH. Incidence and predicted risk factors of pressure ulcers in surgical patients: Experience at a medical center in Taipei, Taiwan. Biomed Res Int 2014;2014:416896. Sari AA, Zavare ZB, Arab M, Rashidian A, Golestan B. Factors affecting pressure ulcer in the ICU units of Tehran university of medical sciences teaching hospitals. J Sch Public Health Inst Public Health Res 2010;8:8-92. Tschannen D, Bates O, Talsma A, Guo Y. Patient-specific and surgical characteristics in the development of pressure ulcers. Am J Crit Care 2012;21:116-25. Ahtiala MH, Soppi ET, Wiksten A, Koskela H, Grönlund JA. Occurrence of pressure ulcers and risk factors in a mixed medical-surgical ICU – A cohort study. J Intensive Care Soc 2014;15:340-3. Amirifar S, Masouleh SR, Pourshikhian M, Monfared A, Leili EK. Predictive value of Braden scale in pressure ulcer occurrence in hospitalized patients. Holistic Nurs Midwifery J 2013;23:8-15. Frankel H, Sperry J, Kaplan L. Risk factors for pressure ulcer development in a best practice surgical intensive care unit. Am Surg 2007;73:1215-7. Boyko TV, Longaker MT, Yang GP. Review of the current management of pressure ulcers. Adv Wound Care (New Rochelle) 2018;7:57-67. Scarlatti KC, Michel JL, Gamba MA, de Gutiérrez MG. Pressure ulcers in surgery patients: Incidence and associated factors. Rev Esc Enferm USP 2011;45:1372-9. Chou R, Dana T, Bougatsos C, Blazina I, Starmer AJ, Reitel K, et al. Pressure ulcer risk assessment and prevention: A systematic comparative effectiveness review. Ann Intern Med 2013;159:28-38. Lewicki LJ, Mion LC, Secic M. Sensitivity and specificity of the Braden scale in the cardiac surgical population. J Wound Ostomy Continence Nurs 2000;27:36-41. Kim JM, Lee H, Ha T, Na S. Perioperative factors associated with pressure ulcer development after major surgery. Korean J Anesthesiol 2018;71:48-56.